In addition to PDF documents, enterprises using Vitrium Security can also protect, control, and track images, Microsoft Office files, and OpenOffice files for secure content distribution. Vancouver, Canada, December 19, 2017 --(PR.com)-- Vitrium Systems today unveiled Vitrium Security Version 7, the latest and most innovative release of the leading content security and digital rights management (DRM) software. In addition to protecting PDF files, Vitrium Security now protects a range of new file formats including images, Microsoft Office, and OpenOffice files. Version 7 delivers an extensive set of content encryption, digital rights management, and analytics features to enterprises that distribute confidential, sensitive or revenue-generating content in a secured and controlled way. 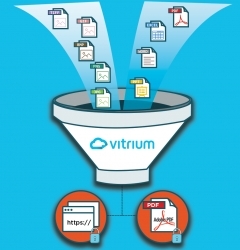 Less than a year since launching Vitrium Security as the replacement, both in branding and technology, of the document security solution ProtectedPDF, Vitrium has delivered on increasing its focus from securing PDF documents to securing additional file types. With the introduction of image protection, Vitrium Security has evolved from to a multi-format Enterprise Content Security and DRM platform. Users of Vitrium Security can now apply security settings, DRM controls, and distribute their image files (including all the popular formats: JPEG/JPG, PNG, TIFF, BMP, and GIF) via secured web links or a client portal. Using Vitrium Security’s newly released drag and drop functionality, customers can now easily upload, convert, and protect Microsoft Word, Excel, and PowerPoint files, as well as its corresponding OpenOffice file formats to Vitrium’s dashboard for safe distribution as secured web links and PDFs. Version 7 features the most advanced military-grade encryption for uploaded Office and image files, empowering administrators to apply the same robust DRM settings previously available only to PDF documents. These DRM settings include controlling online and offline access to files, limiting access by IP and device restrictions, remote deleting files, in addition to adding watermarks and applying copy and print restriction. Vitrium Security Version 7 also introduces digital content distribution via a secured client portal, Vitrium’s Central User Portal. The Central User Portal enables Vitrium customers to offer a unique access point for their audiences to access their digital library of protected images, PDF files, and Office documents. Content can be previewed with image thumbnails, as well as organized with the solution’s content tag management functionality, and available with different viewing options. The Central User Portal can be easily customized and deployed in a matter of minutes, creating a branded and password-protected area for their audience to access secured documents and images. In addition to new file formats and improvements in Version 7, Vitrium Security users continue to have access to a full audit log for tracking purposes as well as access to analytical reports that provide incredible insight into how users are accessing and consuming content. Information such as what files were viewed, when they were viewed and from what type of device, application or browser. Even granular data like what pages were viewed and how much time was spent on each page can be viewed in Vitrium Security, empowering publishers and organizations with powerful metrics. Vitrium delivers enterprise content security and digital rights management (DRM) software for organizations that create, publish, or distribute proprietary, confidential or revenue-generating documents and images. Vitrium technology integrates with an enterprise’s existing content management, document management, eCommerce, or other systems and contact databases to deliver military-grade encryption, file-level protection, and analytics for control and insight into how content is used by an audience. Upload various content file formats to Vitrium Security and distribute them as secure web links and PDFs via a website, content management system, email, or Vitrium’s Secure Client Portal. Vitrium protected content have been published and distributed by thousands of companies and accessed by over a million users worldwide.